(1) Reference is herein made to the above subject who is being prosecuted by the Federal Bureau of Investigation, Detroit, Michigan, for an offense involving attacks on women who were lured through false advertisements for work. 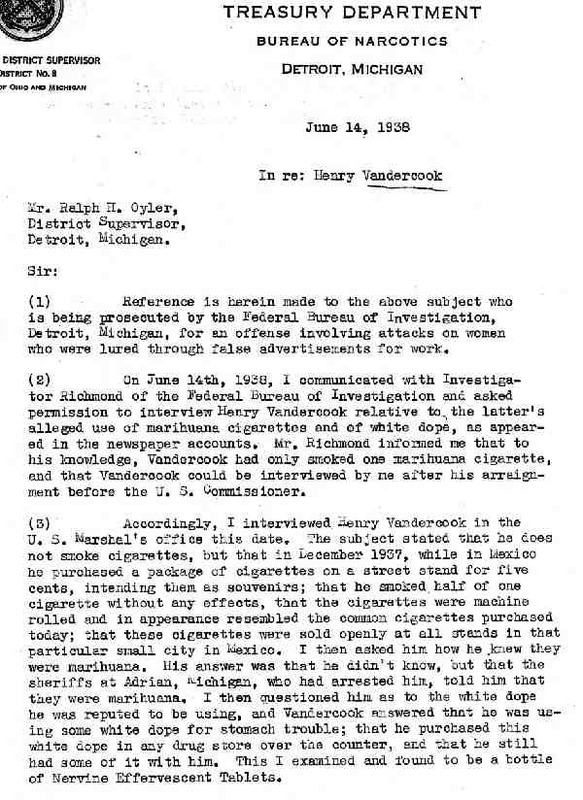 (2) On June 14th, 1938, I communicated with Investigator Richmond of the Federal Bureau of Investigation and asked permission to interview Henry Vandercook relative to the latter's alleged use of marihuana cigarettes and of white dope, as appeared in the newspaper accounts. Mr. Richmond informed me that to his knowledge, Vandercook had only smoked one marihuana cigarette, and that Vandercook, could be interviewed by me after his arraignment before the U. S. Commissioner. 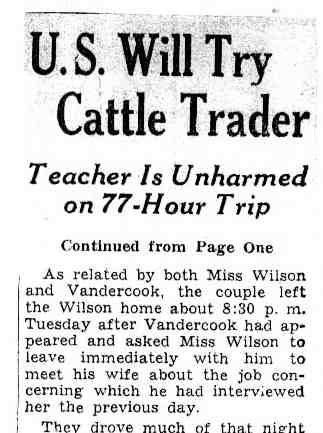 (3) Accordingly, I interviewed Henry Vandercook in the U. S. Marshal’s office this date. The subject stated that he does not smoke cigarettes, but that in December 1937, while in Mexico he purchased a package of cigarettes on a street stand for five cents, intending them as souvenirs; that he smoked half of one cigarette without any effects, that the cigarettes were machine rolled and in appearance resembled the common cigarettes purchased today; that these cigarettes were sold openly at all stands in that particular small city in Mexico. I then asked him how he knew they were marihuana. His answer was that he didn't know, but that the sheriffs at Adrian, Michigan, who had arrested him, told him that they were marihuana. I then questioned him as to the white dope he was reputed to be using, and Vandercook answered that he was using some white dope for stomach trouble; that he purchased this white dope in any drug store over the counter, end that he still had some of it with him. This I examined and found to be a bottle of Nervine Effervescent Tablets. 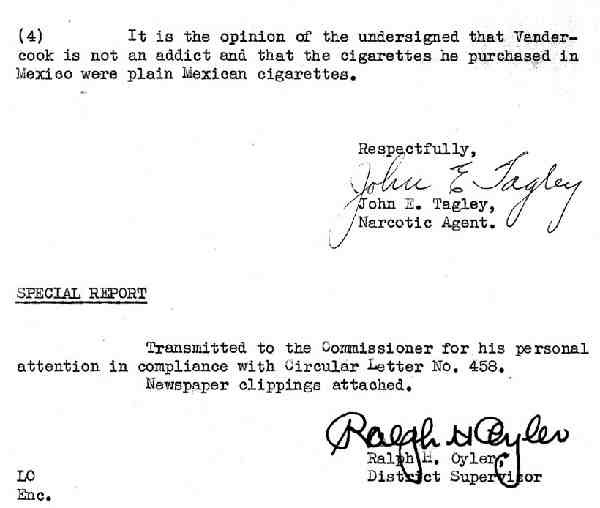 (4) It is the opinion of the undersigned that Vandercook is not an addict and that the cigarettes he purchased in Mexico were plain Mexican cigarettes. Transmitted to the Commissioner for his personal attention in compliance with Circular Letter No. 458.